Hi All. I'm super excited today to announce the official release of our InstantForum 2017 update. As you would expect InstantForum 2017 boosts dozens of highly requested features. These include new split, merge & soft delete options for moderators, the ability for users to @mention other users, GitHub support for developers to name just a few. We've also made hundreds of improvements for this update both in terms of UI and code. Our goal has been to hopefully ensure InstantForum 2017 is our highest quality release to date both for end users interacting with the forums & developers working with our code. 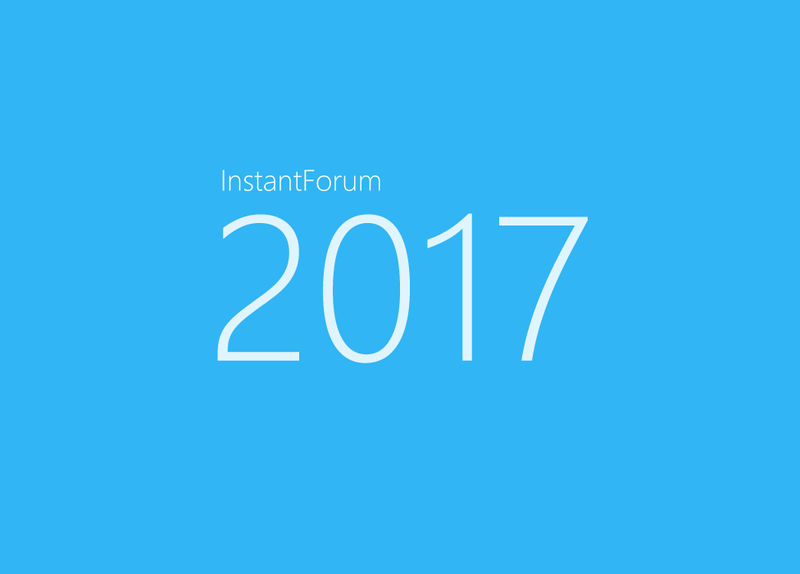 For a complete list of all the new features and improvements included within InstantForum 2017 please see our InstantForum 2017 Release Notes. You can of course also try InstantForum 2017 via our online demo. With our focus on quality and addressing as many reported issues as possible our InstantForum 2017 update has inevitability taken some time. To thank all of our InstantForum 2016 customers who have allowed us the time to ensure InstantForum 2017 is top-notch for the first time ever we'll be offering a major upgrade at no extra cost. If you own a InstantForum 2016 license our InstantForum 2017 update is free for you. We won't do this every year so take advantage whilst you can. InstantForum 2017 has been added as a free upgrade for all existing InstantForum 2016 customers. If you purchased a InstantForum 2016 license or purchased a InstantForum 2015 to 2016 upgrade our InstantForum 2017 update is completely free. You can download InstantForum 2017 right now from your My Licenses page. For upgrade instructions please refer to our InstantForum 2016-2 to 2017 upgrade documentation. If you believe you're entitled to the InstantForum 2017 upgrade free of charge but don't see the download on your My Licenses page of course please don't hesitate to contact us. If you own InstantForum 2015 and would like to upgrade to InstantForum 2017 you would need to purchase our InstantForum 2017 upgrade. If you're using InstantForum 2014 or earlier you will need to purchase a new InstantForum 2017 license to upgrade your existing installation to InstantForum 2017. A special thank you to all the folks over at the SkyDemon & SqlServerCentral forums for helping us test during the InstantForum 2017 release candidate phase. We sincerely appreicate all your feedback and you taking the time out of your day to help us hopefully keep improving InstantForum. Of course software is never complete and we are already looking ahead to our next minor update to address any newly discovered issues. As always we sincerely hope you enjoy the InstantForum 2017 update. We feel this is our highest quality release to date and we hope you'll agree. If we can assist with any upgrade concerns, comments or questions of course please never hesitate to contact us or submit a support request. We'll assist as quickly as possible.